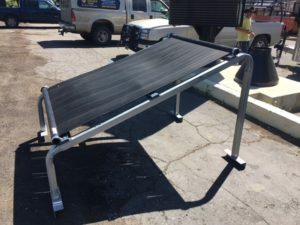 SunnyCal introduced a new solar support support stand for solar and spa pool heaters. 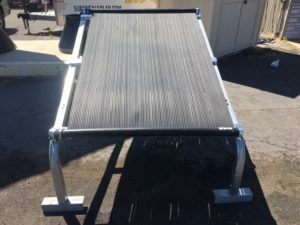 This galvanized structure can be purchased on 4 ft width segments, for module lengths from 6 to 12 ft long. The stands are ground mounted, with adjustable leg heights to accommodate off-level variable terrain. Assembly requires standard handheld drill with screwdriver tips and drill bit. Typical residential pools require 7-10 thermal collectors. New Law Coming: PGE to Pass Fire Costs to Ratepayers ? SunnyCal Offers Solutions to PGE Charges for Fire Losses.